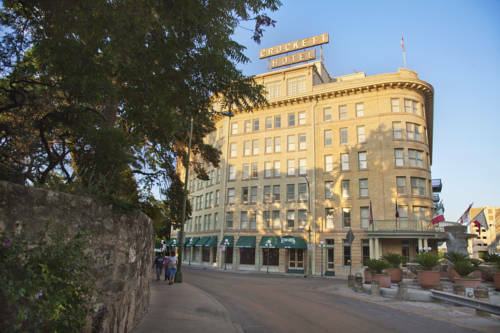 The Crocket Hotel is just steps away from the Alamo and across the street from Rivercenter Mall gateway to the world famous Riverwalk. Steeped in Texas tradition and history this landmark and its staff will make your stay a treasured memory. As a result of careful renovation in 1982 the Crockett Hotel is listed on the National Register of Historical Preservation Certification From the U. S. Department of Labor. Again renovated in 2007 guestrooms are dressed in the finest of furnishings and colors ranging from the soothing sage to a Comforting cream invoking the charm and elegance of a boutique hotel with interior shutters as well as local artistry depicting Regional history. All 138 guestrooms are non smoking. The hotel is also a proud member of the Historic Hotels of America. When remembering the Alamo remember the Crockett Hotel. Just 18 steps from the Alamo Across from Rivercenter Mall gateway to the Riverwalk 2 Blocks from Henry B. Gonzales Convention Center Trolley access to Alamodome Market Square and the Historical King William District 15 minutes to San Antonio International Airport 2 Blocks from the Hemisfair Plaza - Tower of Americas Various shops and museums to visit within walking distance. Cancel Policy requires at all reservations must be cancelled 72 hours prior to arrival date to avoid a penalty of one room and tax. Exceptions may apply - please see rate rules. 18 steps away from the property.